A research team led by PNNL mapped more than 2,100 sites that may switch redox reactions on and off in cyanobacteria. How these redox switches react in light and darkness will affect cyanobacteria’s use in producing biofuels. Results: Chemical reactions involving reduction and oxidation, or redox, play a key role in regulating photosynthesis in plants and metabolism in animals and humans, keeping things running on an even keel. Now, in a study reported in Molecular & Cellular Proteomics, a team of scientists from Pacific Northwest National Laboratory and Washington University in St. Louis shed light on the role redox plays in cyanobacteria, tiny organisms with the potential to produce a lot of energy. The research team discovered more than 2,100 molecular locations inside a cyanobacterium where an amino acid known as cysteine either switched on or off by redox processes when the cyanobacteria were exposed to light or dark. The work significantly expanded the current repertoire of known redox changes within cyanobacteria. "Despite the significance of cyanobacteria for future industrial needs, the overall knowledge of molecular site-specific redox changes is still very limited, especially under light conditions," said Dr. Wei-Jun Qian, a PNNL bioanalytical chemist who worked on the study. "This work provides a quantitative and site-specific analysis across the entire complement of proteins in cyanobacteria, giving us a much clearer picture of the kind of conditions cyanobacteria will need to thrive in industrial settings." Why It Matters: Cyanobacteria are increasingly recognized as potential microbial biofactories for producing chemicals and biofuels from solar energy and carbon dioxide. Redox changes within the organism can affect the efficiency of biofuel production. 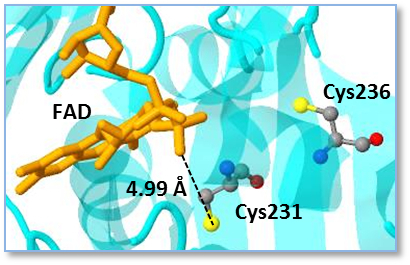 Until this study, scientists did not know the specific cysteine sites within the organism that acted like switches, turning redox on and off, particularly as light changes from daylight to night. Methods: Scientists grew cyanobacteria in the presence of oxygen and continuous light until the organisms were a certain size. They then exposed the cyanobacteria to one of three regimes: continuous light, continuous darkness, or continuous light and a chemical mixture that would hinder the cyanobacteria's ability to photosynthesize. The research team harvested the cyanobacteria and analyzed cells using advanced mass spectrometry technologies developed at PNNL to determine which redox changes were triggered and how. "The information we gained about how redox changes with light and where the redox switches are located can serve as a unique resource for understanding how cyanobacteria can be used for industrial purposes," said Qian. What's Next? Scientists plan to expand their studies to other types of functional changes within the cyanobacteria. The work will lead to a better understanding of redox mechanisms, their impact on protein functioning, and the effects of environmental changes on cyanobacteria. Sponsors: The U.S. Department of Energy (DOE) Early Career Research Award, the EMSL Research Campaign project, and the DOE Office of Biological and Environmental Research (BER) Genomic Sciences Program under the PNNL Pan-omics project supported portions of this work. Scientists performed some of the experimental work at EMSL, a BER national scientific user facility at PNNL. Reference: Guo J, AY Nguyen, Z Dai, D Su, MJ Gaffrey, RJ Moore, JM Jacobs, ME Monroe, RD Smith, DW Koppenaal, HB Pakrasi, and W Qian. 2014. "Proteome-wide Light/Dark Modulation of Protein Thiol Oxidation in Cyanobacteria Revealed by Quantitative Site-Specific Redox Proteomics." Molecular & Cellular Proteomics 13(12):3270-3285. DOI: 10.1074/mcp.M114.041160. Research Team: Jia Guo, Ziyu Dai, Dian Stu, Matthew J. Gaffrey, Ronald J. Moore, Jon M. Jacobs, Matthew E. Monroe, Richard D. Smith, David W. Koppenaal, and Wei-Jun Qian, PNNL; and Amelia Y. Nguyen and Himadri Pakrasi, Washington University.